What’s the next step for your growing business? You have a website, and you’ve been running it on a shared server using standard Web hosting services. But now it’s time for your business to grow and expand. Perhaps you’ve added e-commerce functionality, or some other transaction processing software. It’s time you upgraded to your own server. With SwitchWorks Server Colocation you can stop worrying about the complexities of connectivity and security for your servers, and focus on managing your business. When your server is located in our secure facility, you’re connected directly to the Internet backbone. That means ultra fast, redundant, upstream Internet connections, with multiple power supplies and enterprise-grade security. 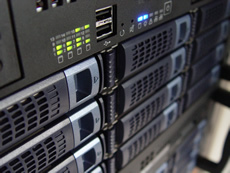 All SwitchWorks Server Colocation services offer 100 Mbps service with a central UPS connection. We guarantee 99.95% network uptime, and 100% power uptime. For most small businesses, having to manage your own server is a tedious exercise. With SwitchWorks 1V Virtual Server you don’t need any hardware. You get all the benefits of having your own server in a secure data center, without every having to worry about it! Linux operating system included; Windows environment available at an additional charge. This package includes 50 GB of storage, 150 GB of data transfer and 1 Static IP Address. Call SwitchWorks at 416-531-8750 to find out more about Colocation services.